Rice cooker oatmeal experiment #3? #4? This time with a little guidance from Tracy last night in the comments, I set the timer to porridge setting and crossed my fingers all would work well. 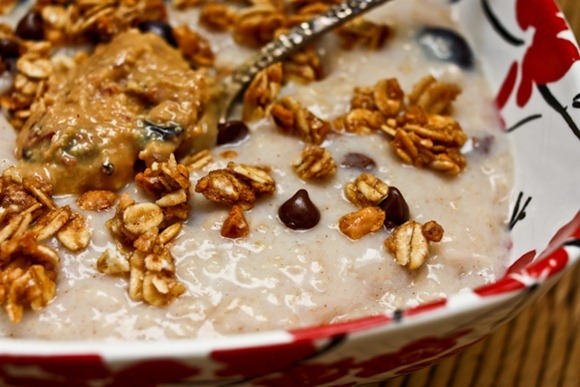 Ingredients: 1/3 cup Coach’s Oats, 1.33 cups water (A LOT! ), cinnamon, pinch salt, dried currants. I woke up before it was time and snuck out to take a peek. I think I heard it turn on around 7:40, which would mean a 40 minute cooking time. While I waited, I did some chores, got dressed for the gym and made tea. Making oats on the stove top takes 5 focused minutes. This takes longer, but it forces me to do little chores that I would save for after. I’m loving the efficiency! When it finally sung that it was complete at 8:20, I crossed my fingers and opened the lid. And in fact, it was perfectly cooked! A little dry on the bottom, but liquidy on the top and stirred them together was great. I added 1/3 cup of milk at this point (for protein!) along with half a banana and blueberries (I was afraid to add these the night before for food safety reasons). I closed the lid and gave it 2 minutes of heat before portioning into my bowl. Toppings included Nuts About Granola Lovers Blend (PB + Chocolate Chip minis!!) and Yum Butter. Note the texture – this was a true porridge! But as a result of all the water and lack of banana and milk, it was really really bland. Not really worth the pros. But definitely fun to add to the breakfast rotation because it was so different than my usual oatmeal. Bland oatmeal is not my cup of tea. But I will still make it again because the toppings made up for that. Great bowl, Kath! Have a great Monday. okay 1) that weather is insane. I am so jealous! and 2) maybe adding cinnamon and vanilla would help with the bland taste? I LOVE soupy oats so those would be perfect for me!!! That texture looks SO spot on. 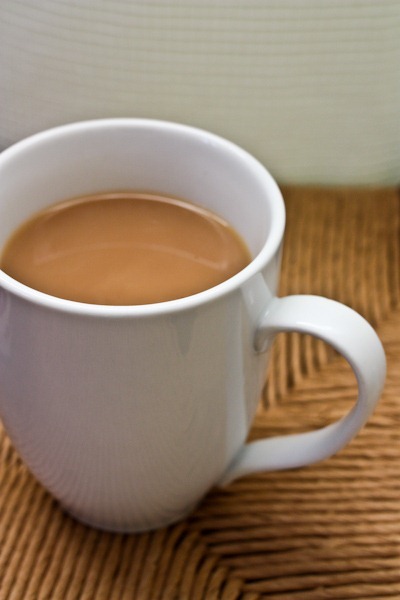 I thought that was coffee, but it is tea. You will perfect your oatmeal in the rice cooker soon 🙂 I am sure it just takes a few times at experimenting. Do you like your rice cooker? 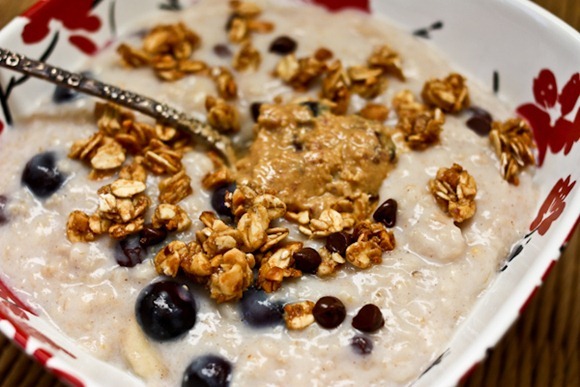 The toppings always make the oatmeal! I love my toppings! Have a great day Kath and enjoy the weather! Perhaps flavouring the water…infusing it with flavour…really watered down purreed bananas for instance? Cold and icy run this morning…very pretty run with the light covering of snow. Much better than muddy and dark in my books! I am in a decluttering challenge this month. Who knows what I shall unearth? Very excited to get myself organized…any tips? My advice is to just donate everything 🙂 We think we need so much stuff, but we can live with less. What you do need – find the perfect spot for everything. Thanks. I have already started two piles: one to take to the Women’s Shelter and the other to the Diabetes Association. It feels good giving my things a new home! I add chopped dates, cut up banana and almond milk with lots of cinnamon, the night before. This has been safe! Oatmeal still porridge like but flavorful and creamy. Probably if chia seeds added in the mix before cooking, less soupy? Boo – I hate when breakfast is less than what I was hoping for. At least you have lunch to look forward to! And that YumButter…I’m definitely going to have to get my hands on it. It looks AWESOME. Also? It’s 32 here! I’m SO jealous of your warmth! Send some our way please!! Try stirring in applesauce towards the end: it may help with the blandness! That bowl is so pretty! I’m guessing just making overnight oats might be better than the cooker method. Still time efficient but with flavor. mmm oatmeal always hits the spot. what great weather you’re getting to enjoy! Soupy oatmeal is the one thing I cannot tolerate. If mine does that on accident, I add protein powder or peanut flour. At least you had some awesome toppings! I LOVE that bowl!! I’m hoping to squeeze in a run (or at least a walk!) in the gorgeous weather this week…. I wish the sun would rise before 7:20am! Have a great Monday. Well even though it may have tasted a bit bland, it certainly looked pretty! I’m so jealous of your weather – we’ve received a TON of snow over the weekend and I am not enjoying it! Have a great day! That weather is amazing! This winter has been very kind to us all, Chicago is expected to hit 51 degrees tomorrow. Anything about 40 in January in the midwest is definitely a miracle! I made rolled oats in my rice cooker this morning for the first time after being inspired by your trials last week. 🙂 I soaked the oats overnight in the rice cooker with raisins, then strained and rinsed them and added fresh water this morning when I woke up (I usually use water to save calories since I add a lot of fixings). I added chopped banana and apple this morning and turned the rice cooker on. By the time I was done getting dressed, my oats were ready. They were a little soupy, but not as much as yours, and when I stirred them a lot of the water evaporated. I added some cinnamon and ginger, shredded coconut, and a spoon of sunbutter. My boyfriend and I each took a pint-sized jar to work to eat at our desks and I’m just finishing mine now! Which settings did you use? my rice cooker is really basic. it only has cook and warm functions and switches automatically to warm when its done cooking. Aren’t you spending more that 5 minutes with the night before prep + additional steps following a.m. (toppings, milk, 2 mins to re-heat)? Seems like the hands off idea is nice, but the hands on for this is more than the hands on time of the stove top? But good luck with ratios if you keep trying. Whenever my oats are bland, I add a little vanilla protein powder and cinnamon. You get the nutritional benefits, and you get a nice sweetness without sugar. Unsweetened vanilla almond milk can also boost your flavor. I am always disappointed in bland oats. Of all the ways to experiment with oatmeal, I really give my vote to overnight oats. I think soaking just brings out the natural sweetness in the oats without having to add anything. I am really stuck on baking them the night before or using the slow cooker. I also like to toast the oats first, I really feel like it adds another layer of flavor. Pure vanilla extract and dried unsweetened cherries (like 5) and raisins (7-8) and one prune or fig (diced into 4 pieces) plus more cinnamon will jazz this up in a major way for you. Bummer that the oatmeal didn’t turn out as well as you hoped. Could you add banana while you cook it?? I don’t really understand the whole rice-cooker-method, but it could help the flavor! Maybe stove oats are the oats for you. Let the rice cooker cook rice. Just because you bought an expensive appliance doesn’t mean you have to force yourself to use it. Just let it go and let it make rice…it’s ok. But I’m having so much fun! I’m glad to hear that…I thought it was making you blue. I’ve often thought of cooking oats overnight in the crockpot so they’d be ready in the morning. But, I don’t think I’d be able to sleep with all of the delicious smells going through the air! Sorry about your bland oats- I feel your pain. What a bummer. And yes- at least you have THAT forecast to look forward to this week! That is one insane weather forecast!!! Keep at that rice cooker. I’ve cooked oatmeal in it before and it turned out, though I tend to like soupier oats. Gorgeous weather! See that’s what I’m scared of with my rice cooker. I can just moderate it on the stove. Florida is looking gorgeous this week so I’m enjoying exercising outdoors! 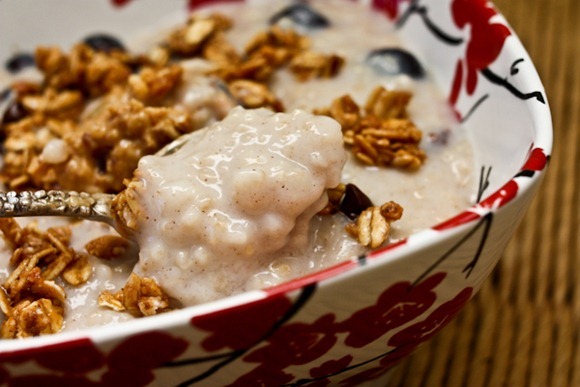 Your oats look yummy – I love soupy oats without a lot of toppings, so the oat flavor really comes through. Of course, I also love to make oatmeal with cinnamon and maple syrup that is thick as mortar, but sometimes, soupy oats are where it’s at. Did you salt them at night? Also, what are the food safety concerns about adding banana and blueberry at night? And milk for that matter. It’s not going to spoil overnight while cooking. I did salt them at night. There really isn’t much with the fruit since it doesn’t have to be refrigerated. It was the thought of them sitting in water overnight that made me think about bacteria growth. Probably not a huge deal though. Esp. for the banana since it’s in a peel until that time. But the milk is a huge concern. Unlike a crockpot, the ingredients are at room temp until cooking begins, 8-10 hours later. That’s a long time for milk to be unrefrigerated and in the temperature danger zone. I love that bowl! It’s so cute 🙂 You are going to be having some amazing weather! 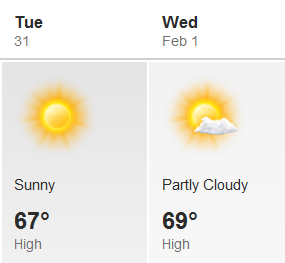 I think the weather where I live is going to be near the 60’s as well. I definitely think I would like the rice cooker oats! There have been too many times where I’ve put it on the stove.. then tried to to a chore.. got caught up in the chore.. and ended up with oatmeal burnt on the pan. SO hard to get that stuff off! I tried this last week as well. It was a HUGE mess and not worth the clean up for me. I had a pile of goo that came out the steam hole of the rice cooker and went all over my counter. And like most people have noted the final product was just too soupy for me. Total fail! I did find a better alternative though. If you bake them at 400* for an hour it comes out perfectly. You can add your banana too so they aren’t as bland. I used banana and cinnamon. By the time I was done with my workout breakfast was ready. Ooops! Sorry it didn’t turn out quite like you were hoping. I definitely don’t add that much water. I user a little less than a cup. Maybe that made a difference? Hope my directions didn’t ruin your breakfast! Have a good rest of the day, Kath. No worries! They didn’t burn or boil over so I was happy. And I’m still trying to decide of the blandness was worth it for the huuuuge portion! Maybe next try you should compromise with a little less water and add chia for thickness? Also, did you add vanilla? Lots of flavor there! And also I usually add chia seeds when I first open the lid and add milk. That thickens it up quite a bit! Sorry re. the lackluster results of your experiment. 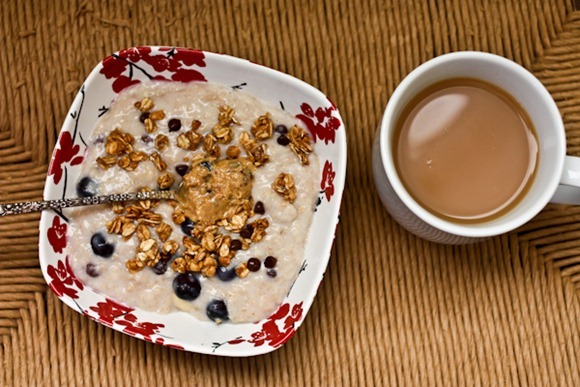 As for me, I’ll stick w/ spending 5 -10 minutes making my oats the old fashioned way. I don’t find it necessary to constantly attend to them while cooking. Even with your mad (!) photography skills, Kath, I am afraid those soupy oats look a bit blah to me. My mom and dad always made oatmeal in the crockpot and I always felt it was too mushy. I like throwing in some farro, steel cut oats or brown rice to make it more chewy. I am not a huge fan of soupy oats! My oats were a little soupy this morning, it was def. not my morning for cooking! Wow that really is one big bowl of oatmeal!! It is currently 69 here in Lincoln, Nebraska. HOT, since the normal high is in the 30s. Tomorrow is February and we haven’t even had enough snow for my kids to build a snowman or go sledding. Most of Nebraska is now in a warmer zone on the USDA plant hardiness zone map making easier to grow plants like peaches. All of these kitchen gadgets take getting used to. Do you put salt in your oats? I definitely notice a difference in flavor when I do vs don’t. Maybe you can use almond, rice, hazelnut milk so you can put it in the night before and not worry about it spoiling? I think the oats would really absorb the flavor and be delicious! Would that work or do you think almond/hazelnut milk would spoil over night in the rice cooker? That wouldn’t really be a long term solution for me because they are so expensive. I used to buy vanilla hemp milk and it was good – just pricey. I actually really like when I start out with really bland oatmeal because it allows me to dress it up any way I want without messing with any flavor it might already have. I’ve never used a rice cooker before but am now really intrigued, especially since realizing you can use it to make things other than just rice. What brand do you have? 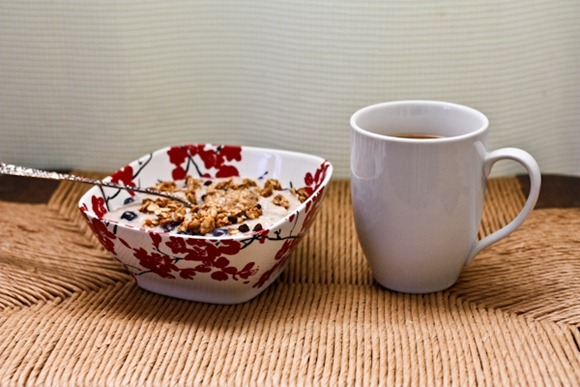 Did you use regular rolled oats or steel cut? I’ve made steel cut oats in my slow cooker many times and I wonder if the outcome would be similar to that. Be thick and chewy for me! I make my oatmeal in the microwave. You have to babysit it a little bit and maybe add more water at times, but when it all bubbles up, it’s so creamy all on it’s own. I like them with oat milk. Almost like a dessert. I use instant oats though. Can’t stand the thought of the stove top cleaning the pot thing unless you use non stick which I’ve discarded years ago. Thanks for everything Kath. Not sure why anyone would use a rice cooker for oatmeal. It’s so quick, easy and delicious on the stove! mmm the chocolate chip alone just inspired my breakfast! Im hungry!